If you're expecting good value for your holiday dollars, TDmonthly can show you 20 great toys that kids will play with long after the celebrations are over. Each of these toys is highlighted in TDmonthly's 2008 Specialty Toys Report, where you can read about the type and frequency of testing each product undergoes. Plus, the report lets you find dozens more great toys that are searchable by a variety of paramaters, such as price, age and category. No manufacturer paid a fee to be considered for or included in the Report. So, have fun watching the video, then click onto the consumer version of TDmonthly's 2008 Specialty Toys Report to learn more about these great new and classic toys. Hi, I'm Julie Jones with ToyDirectory and TDmonthly Magazine at TDmonthly.com. Given the economic crisis in our nation, this holiday season is bound to be different than in years past. And we know that, because budgets are tight, you want to make sure your money is well spent. So as you consider what investments to make for your children this season, and which toys will really contribute to their overall development through healthy play, we've got some to show you that our staff and reviewers have found to be some of the most exciting, innovative and creative options for this year. Now, all of the products that I'm going to show you are in TDmonthly's 2008 Specialty Toys Report, "Positive Toys for a Promising Future," and most of them are among the 44 winners of a 2008 TDmonthly award. 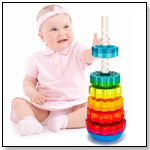 So, to start off, we know that building blocks are such a staple for development for kids, and this one is different because these blocks — Stack & Stick from Peters' Group — actually stick together. They come on this base so they can be carried from room to room once the creation is built. 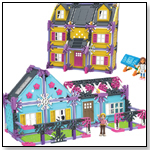 Right here we've got a fun science kit, Snap Circuits from Elenco Electronics. They can build on this circuit board and make doorbells, alarm radios, and the book has more than 300 projects. Also on the science-y end of things, we've got the HEXBUG from Innovation First, and, normally bugs aren't so friendly, but this little creature moves along, senses when objects are in its path and goes a different direction — also responds to claps and other loud noises. (clap, clap, clap) It comes in a lot of different colors and some different designs. Now, going into the game realm, which are also wonderful to build relationships and a great thing for families to enjoy together, this is Beyond Chess. And there are so many variations of the chess game, but what makes this one inherently different is that the pieces are all separated. This is actually the game board, and it's kind of a make-your-own and then move the pieces as you play. Another product kind of in that same vein is Flibbix [by Merillian] up here. It's a design-your-own game board and comes with these brightly colored magnetic tiles that magnetically snap together so that children can build their game board and have a sense of ownership in the games that they're playing. Now, right up here we've got this cute, little plush orangutan — a WebWild from Folkmanis — and it's one of the many online-plush items that have come after the very popular Webkinz by Ganz. Now, the difference with this guy is he's a puppet. And the line has an educational website that was developed in partnership with a non-profit called Globio. And there are a lot of great very educational features and videos that show animals in their natural habitats. Over here, sticking with some fun plush, these are the Deglingos distributed by All New Materials. These are designed in France and they have a lot of fun fabrics, a different kind of design element, a little bit more quirky than you'd normally see. And these are the flat version so they're easy for baby to hold, and they kind of mimic the personalities of the big stuffed plush Deglingos. Right here, a little creative toy. These are the Puzzibits by Manhattan Toy. It's a flexible, interlocking pieces that kids can use to make this turtle or other little animals. He's even got a shell over him. And I've got to tell you, the design and texture of these Puzzibits is really great; they're really fun to play with. Looking over here, I've got to tell you that Zoobies have been one of my favorite plush introductions in the last couple of years. And this is a baby version — makes them even cuter. You just undo the stuffed animal right here, turns into a pillow, and then you can also unzip it to reveal a blanket. And this one, because it's designed for babies, even has a fuzzy comfort corner. It's a really great, great plush animals to ride along in a diaper bag and keep a child entertained. Moving on down here, if there are parents looking for an alternative to Barbie [by Mattel] or Bratz [by MGA Entertainment] dolls, these are the Groovy Girls by Manhattan Toy. They're soft-bodied dolls, a little bit bigger than your typical fashion doll, and they really are groovy. They've got lots of fun outfits and accessories, like this scooter here. Zingo, by Thinkfun. This is a really exciting twist on the traditional Bingo game — a great little sliding mechanism that shoots out the tiles and encourages kids to yell when they see something that matches the object on their card. And we know that games aren't always just for fun or education; sometimes they can be for design, and add a little bit to the décor of a home. And we feel like this wooden strategy game from Family Games — it's called Inversé — would be a great decoration on a coffee table as well as a quick-play strategy for two players. Also, right here we've got the glitzy and glamorous Pawparazzi Pets from Noodle Head. This little puppy has a whole slew of friends that are tracked in this Pawparazzi magazine here — covers all their goings-on. And comes with this cute little set with accessories and even a necklace for the dog's owner. Now, when it comes to tween girls, I've got something that is the toy. This is a big hit right here — Sticky Mosaics from The Orb Factory. It's kind of like paint-by-number, all these little numbers on the box. But it comes with these adhesive jewel stickers that go right on the surface and create a really fun and pretty design with a drawer and everything. And it's just a fun project; provides lots of decoration and storage later as well. And then we go a little bit younger, for the babies. And here, we've got a Calin doll from Corolle, and this is an excellent line of quality dolls. Bean bodies, nice vanilla scent — they smell really good — go-to-sleep eyes for when the baby's resting, and they're also sized just perfectly for a little girl to carry around and pretend like she's mother to the doll. Also right here, we've got a classic for girls, Woodkins by Pamela Drake. And it comes with all these different fabric swatches that you just pop in to this template here to change the dancer's outfit. Right over here, also on the artsy side of things, are Brain Noodles. And these take building with pipe cleaners to a whole new level. As you can see, they're much bigger. They're very soft and pliable noodles that can be used to make pretty much anything, but they also come in these designated kits that tell you, for example, how to make a puppy. All right, coming over here, something for boys, mostly. And this is unlike most animal action-type figures in that it's a lot bigger, for one. This is the double-headed dragon from Bullyland Toys — soft and squishy, almost cuddly material, and it's also very poseable, so kids can play with the neck and wings, and add this to their collection of figurines. And then over here, another playset. This one's by Neat-Oh! International, and it's interesting, it's a storage bin and playset all in one. You just unzip both sides along the wheel, and then you simply un-Velcro right here. Opens up into a race track and it comes with these two diecast cars and parking for even more cars, if you want to add to the set. When you're done, just close it up, zip up both sides, and it's got a handle for easy carrying. And lastly here, wouldn't it be awesome to be able to make an object levitate? Well, that's exactly what kids can do with this magic wand. It's called the FunFlyStick, from Unitech Toys. So, if you want to know any more about the FunFlyStick or any of these other products, simply go to TDmonthly.com and click on the "Specialty Toys Report" icon at the top of the page. You'll find a lot of other wonderful products for children in the Report, and you can even watch videos of many of the items featured. Once again, this is Julie Jones, wishing you "Happy Holidays" from TDmonthly.com. •ABC Kids Expo Booths Needed Help! •Don't Miss These Holiday Discounts!